Whitesnake frontman David Coverdale is revealing details about a 2017 surgery in a new interview with Planet Rock. The legendary rocker says he had both his knees replaced with titanium last year. “With all the years of bending and rotating (on stage), there’s wear and tear,” explains Coverdale in the latest issue of Planet Rock magazine. “I’ve got degenerative arthritis in my knees. It got to the point it was hurting so much it was pulling me out of the zone I needed to be in for my performance. 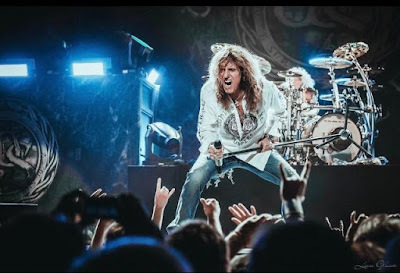 Coverdale and the band – who returned to the road this summer for a North American tour with Foreigner – will next be seen at Tecate’s Mother of All Rock Fest 2018 in Monterrey, Mexico on November 3. The 5CD/DVD Super Deluxe Edition opens with a disc of acoustic versions of material from the band's recent studio albums, 2008’s "Good To Be Bad" and 2011’s "Forevermore"; disc two presents the North American debut of the 1997 unplugged package “Starkers In Tokyo” (previously issued exclusively in Japan) – which sees frontman David Coverdale and guitarist Adrian Vandenberg deliver songs from throughout the vocalist’s career; discs three and four offer more live acoustic sets from several years; and, disc five features more than two dozen of Coverdale's unreleased, acoustic demos. A DVD completes "Unzipped: Super Deluxe Edition" with live, unplugged performances filmed around the world between 1997 and 2015 – including a complete acoustic show recorded at the Cutting Room in New York in 2008 and the 1997 concert video "Starkers In Tokyo" – alongside additional bonus features that include an interview with Coverdale and Vandenberg, bootleg videos, the "Love Is Blind" music video and a slideshow. In addition to the Super Deluxe Edition, “Unzipped” will also be available via multiple formats including 2CD, single CD, 2LP and digital versions.